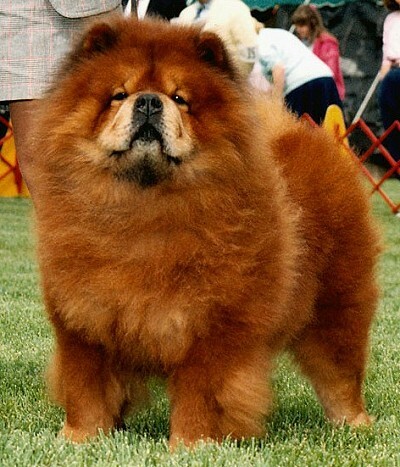 Tiger was one of our foundation sires, and was awarded a Register of Merit from the National Chow Chow Club for the achievements of his offspring. He started his career winning the 1984 NY Specialty from the Bred-By Class (and a Group 2nd) and repeated in 1985, 1986 and 1987. He was BOB at the New England Specialty in 1993 at the age of 9. Two years later, after recovering from two grave illnesses, he was Best in Vet Sweeps and an Award of Merit at the CCCI National Specialty. The same year, he was once again Best of Breed at the New York Specialty. In Tiger's video clip, he is seen at the age of 11, winning the Veteran's class at the CCCI National of 1995 under Frank Sabella. The AKC Breed standard tape used him to illustrate proper movement - he passed this quality on through the generations of his offspring. He lives on in the Domino Chows that followed him and in our hearts. Page Hits: 17,879 © 1997-2019 Domino Chow Chows, All Rights Reserved.